You get free tofu refills with the tofu dinner. The containers on the tofu bar hold steamed tofu. After the steamed tofu course, you may add as much tofu to your tofu as you wish. “Western food. Every damn plate is round”. The truth about Kobe beef is that all wa gyu (Japanese beef) comes from Hyogo prefecture usually from Tajima. Tajima sells the beef all over the Japan. If they buy it in Kobe, it is Kobe beef. 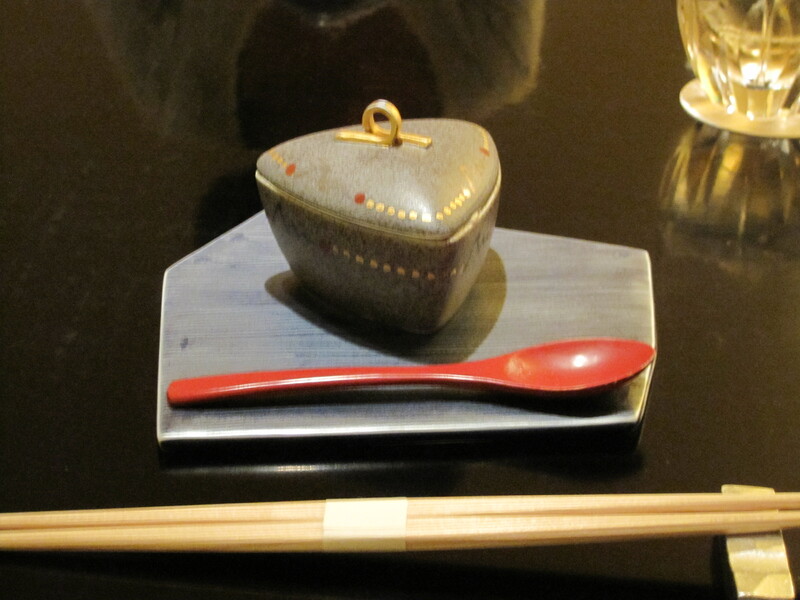 Food is served so beautifully in Japan it is not uncommon to see even the Japanese taking pictures of the food. 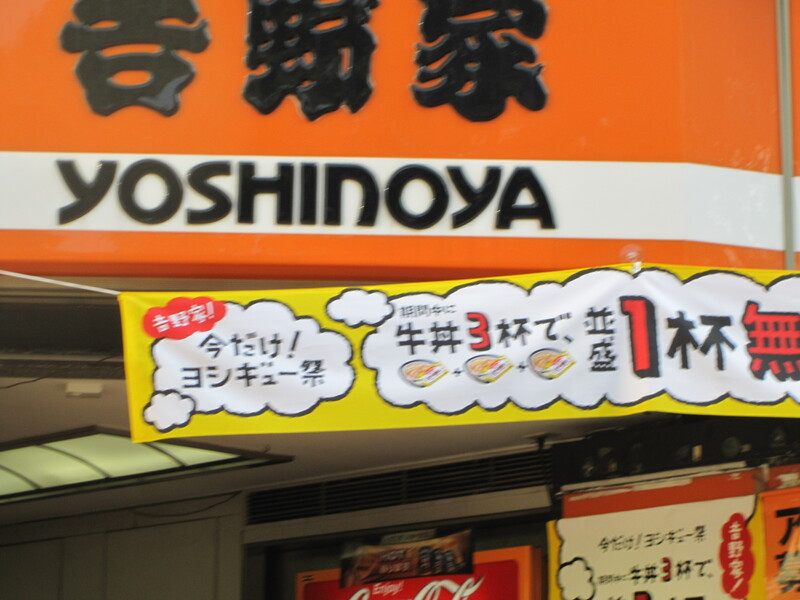 They have Yoshinoya in Japan. It was the first thing I saw leaving the airport. Things to eat in Okinawa are–mango pudding, purple potatoes, Chinese food (Okinawan food is more influenced from Chinese food than Japanese food), teriyaki squid on a stick, barbecued grasshopper legs, pork, pigs feet, pig skin , pig ears, ,goya juice, sooki soba( pork spareribs with soba noodles in soup), Okinawan doughnuts ( deep fried balls of dough) and Mozuku seaweed (seaweed for a long life). 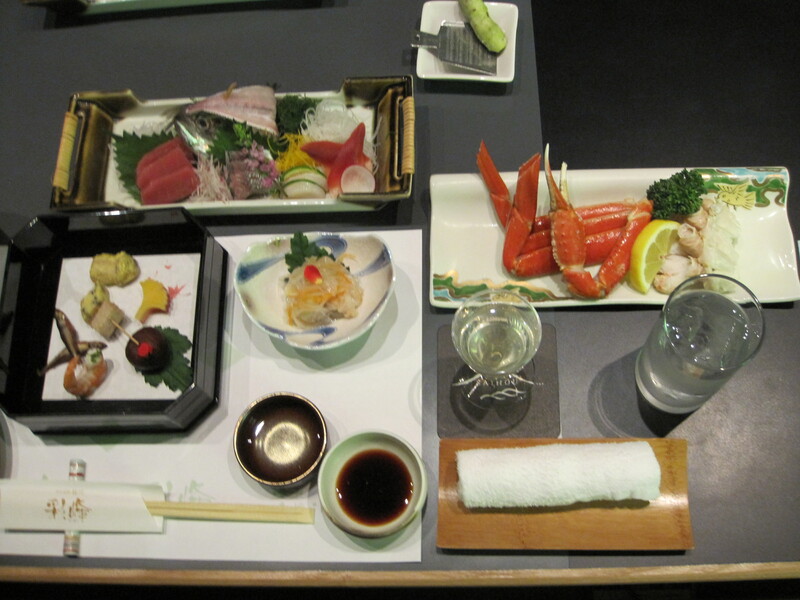 Hiroshima is famous for oysters and anago (salt water eel). 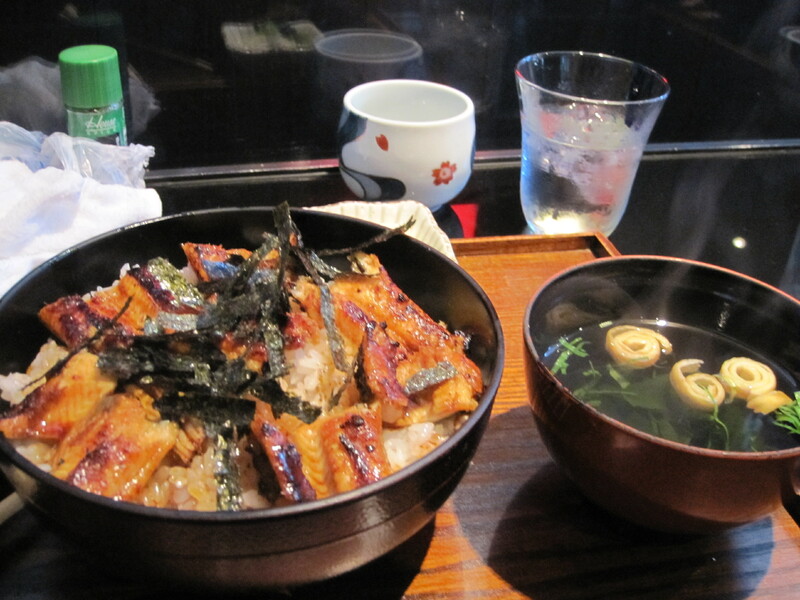 Unagi ( fresh water ell) is more common in the US. It is not to be confused with inago, whole locusts boiled in soy sauce and sugar. 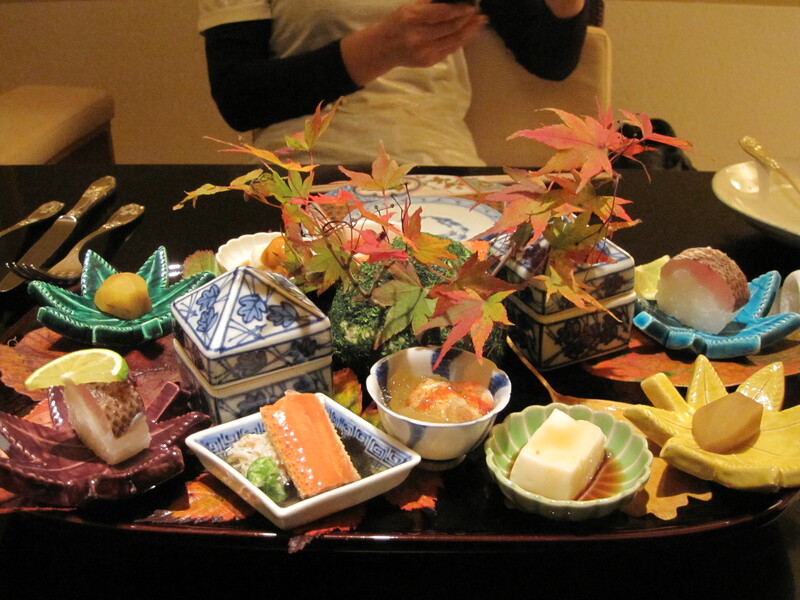 In Japan they say Autumn is the time for art and eating. Japanese women are always on diets . Blowfish ovaries and pig ears are surprisingly delicious until you find out what you are eating. 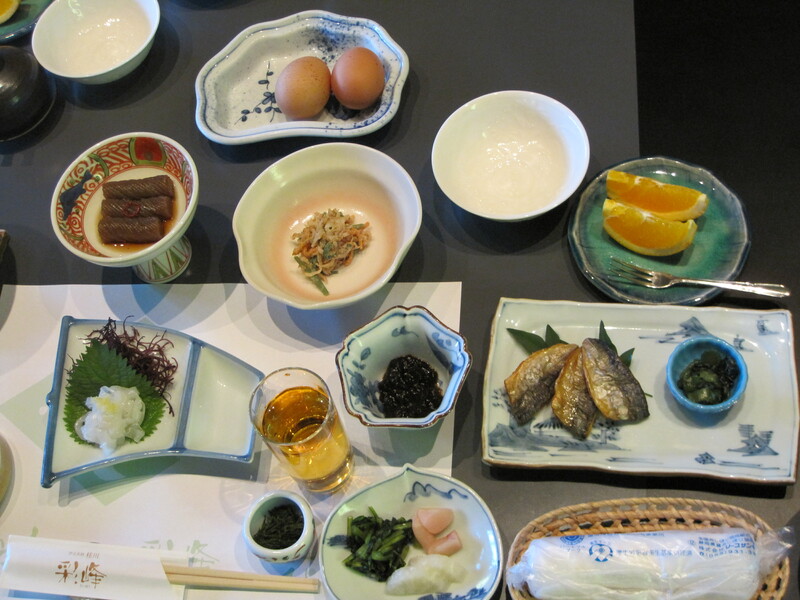 Fugu (blowfish) is a delicacy and speciality of the Kyushu islands. Because it is poisonous, you must have a special license to cook it. Every year a few dozen people are hospitalized. The few fugu deaths each year are fishermen who try to prepare it themselves. The ovaries and intestines must be removed and cooked without puncturing them. (I didn’t know until after) We had an eight course fugu dinner (including ovaries and intestines they made a point of telling us that ). 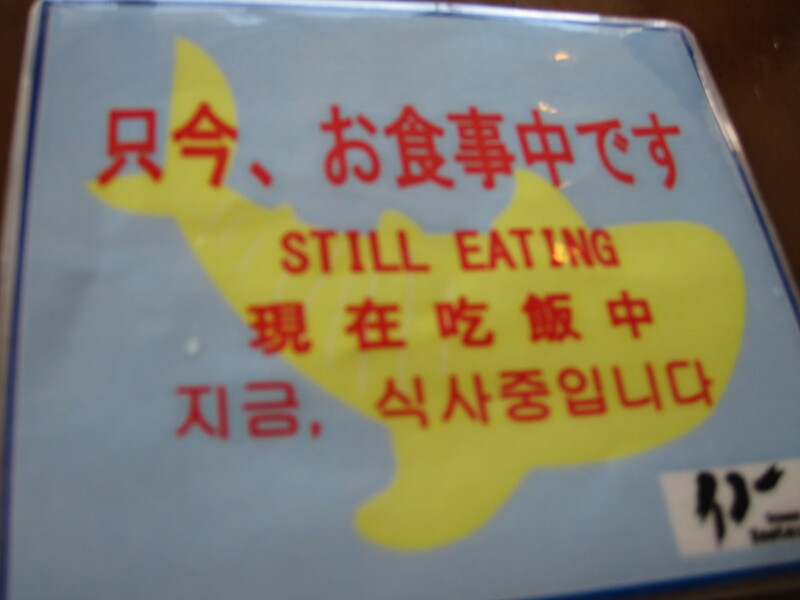 I am still here so the chef must have been licensed. It was the most amazing meal, I had on two trips of amazing meals. 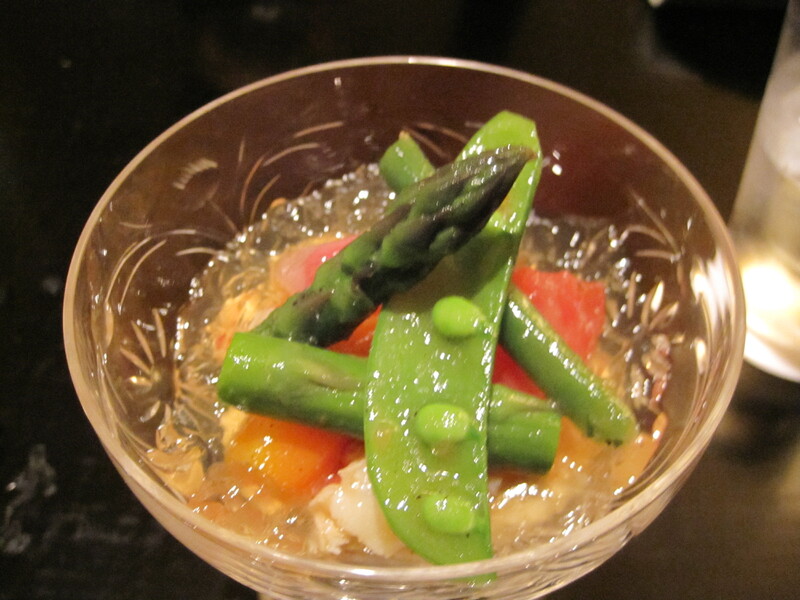 Surprisingly, Japanese eat a lot of eggs as in raw, appetizers and egg sushi. Yakitori chicken (grilled on a skewer) is usually not the breast. It can be thighs, skin, liver etc – because all the parts of the chicken are used. People in Osaka spend more money on food than anything else. Okonomiyaki is kind of a cross between a pizza and a pancake. It is batter mixed with cabbage and fried with different toppings. Okonomi means “to one’s liking”. Unlike pizza and pancakes, the usually filling is octopus, squid, pork, yams or kimchi. Or you can have whatever you want on it. It is most common in Hiroshima and Osaka. The food in Japan is so tasty that you can find a delicious meal in a train station. 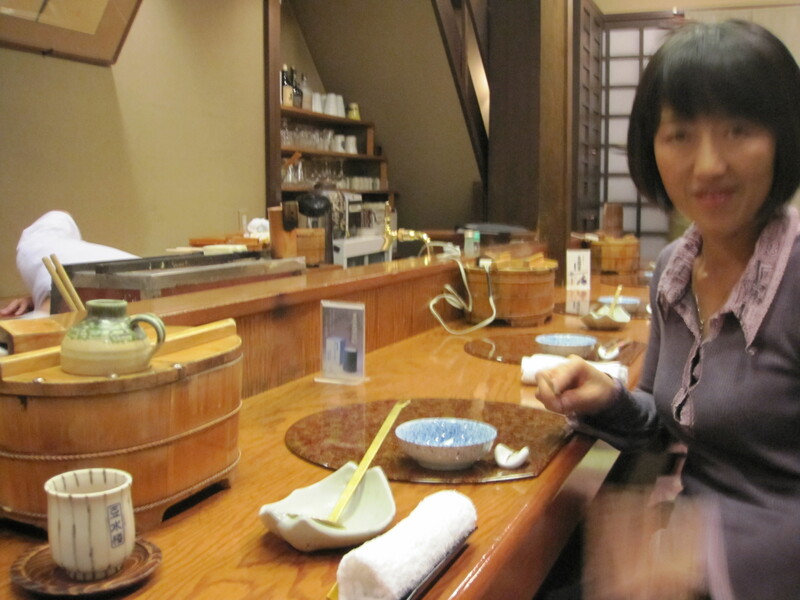 It is considered bad manners in Japan to walk down the street eating or drinking. Hence Starbucks is always very crowded. Japanese now drink more coffee than tea and they all drink “shorts” at starbucks, which have been discontinued in the states. In expensive supermarkets, they bag your groceries, in inexpensive supermarkets you do it yourself. Also the boxes we have at registers for signing and scanning are considered “”so old fashioned” in Japan. Sake means sake but also liquor. Anything can be made out of tofu. 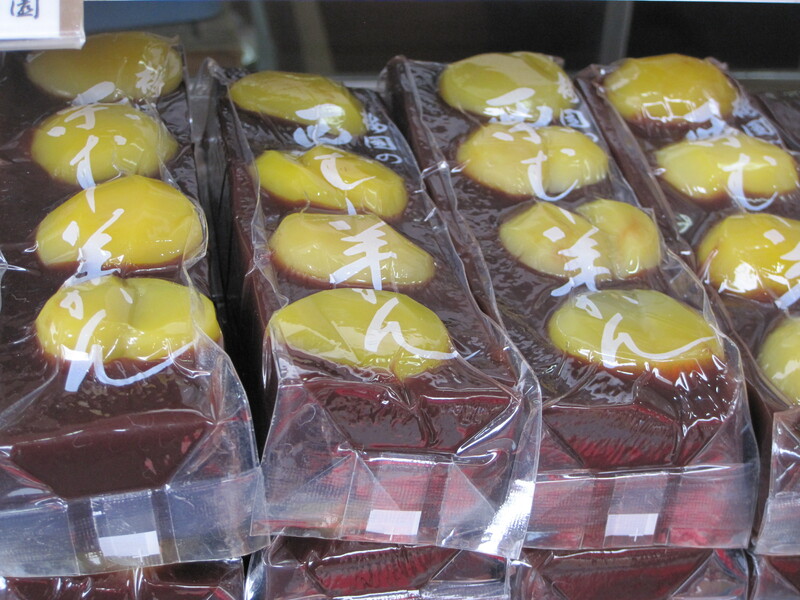 Japanese seaweed is sweeter than other seaweed. ( There are many different kinds of seaweed. –apparently even in nice restaurants in the U.S., we get the cheap stuff). There are hundreds of different soy sauces and sakes. The food department in a Japanese department store is almost always in the basement and can be an attraction by itself due to the wide variety of Japanese delicacies, sweets, desserts and other food on display. The food department at Harrods in London is a boutique compared to some of the Japanese stores. Pockys come in many flavors . 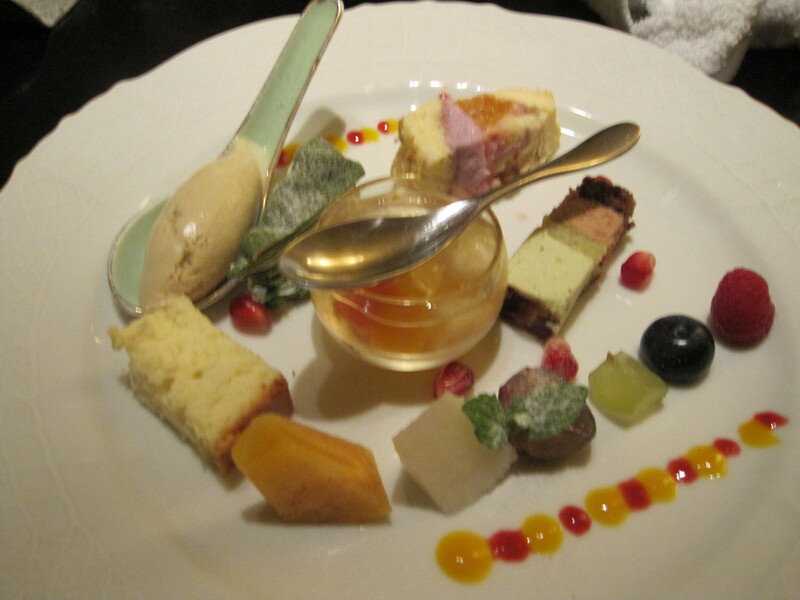 Haagen Daz does seasonal ice creams in Japan. Kit Kats come in seasonal flavors but the most popular is Green Tea. 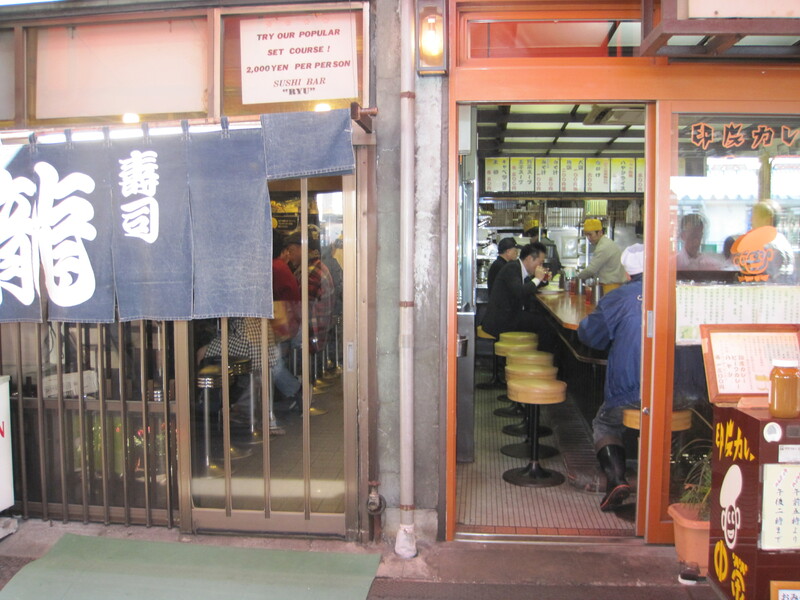 If you are a fan of Japanese breakfasts, Tsukiji fishmarket for fresh sushi in Tokyo is the way to go – the earlier the better, They open at five am. I prefer coffee and toast and getting there at 10. Sushi before 10 am is rough for me. 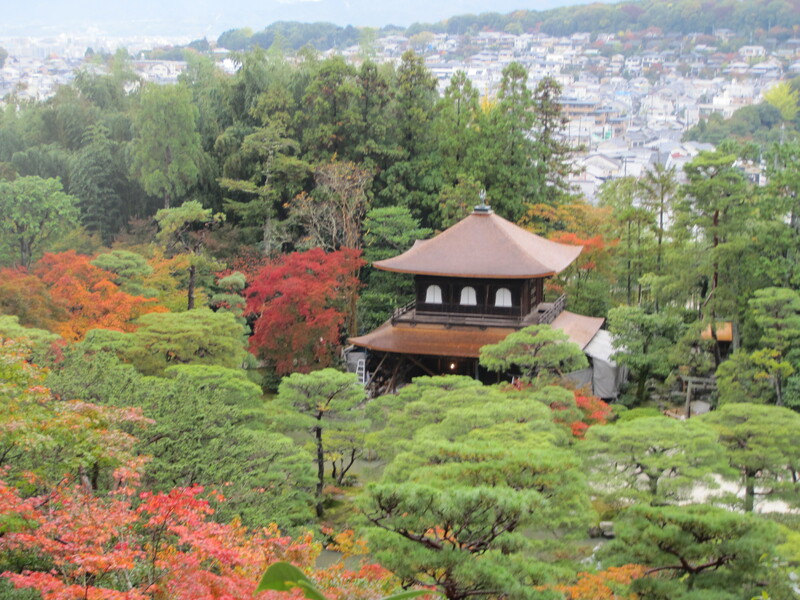 Here is what i found out on my first trip to Japan. I like abalone steak, flounder, red snapper, squid and octopus sushi. I love tofu dinners (eight courses of differently cooked fresh tofu). I like tofu buffet dinners. (every kind of tofu imaginable). I don’t like foo, or the diet jelly stuff, or mackerel (dry raw or whole). I don’t like raw eggs in the morning with rice. I hate roe sushi (which is not what you think-unless you are thinking survivor food challenge) I like green tea soba, green tea mochi and Japanese green tea ice cream ( not what we have here with no taste) I like Japanese desserts –especially black sesame ice cream. I hate to admit this but i did not use chopsticks until my first trip to Japan. I dont have great motor coordination and it seemed like a a lot of work to get the food to your mouth. I was probably the only American in the towns where the ryokans were. The chance of getting a fork was going to be slim. I practiced eating everything with chopsticks at home for two months . My friends, the waiters in the Japanese restaurants in LA and especially my Vietnamese manicurist urged me on. When you set your mind to it, and ask for help when you need it, you can do anything.